You've seen the film, now read the powerful Christian novel which became an international bestseller and changed lives across the world. 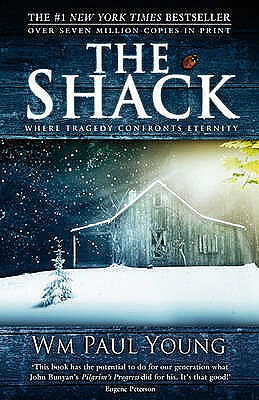 'The Shack', from first time novelist William Paul Young, gives you a run-away best selling novel with a surprising and unconventional explanation of The Trinity and a refreshing view of God's grace and all accepting love. With its story of the restoration of a man torn in two by grief and guilt, The Shack has become a landmark in Christian faith based fiction. Opening up the understanding of The Trinity even to those with no deep knowledge of theology the New York Times bestseller sparked praise and controversy in equal amounts at all levels of church involvement - from new Christians to theological scholars. 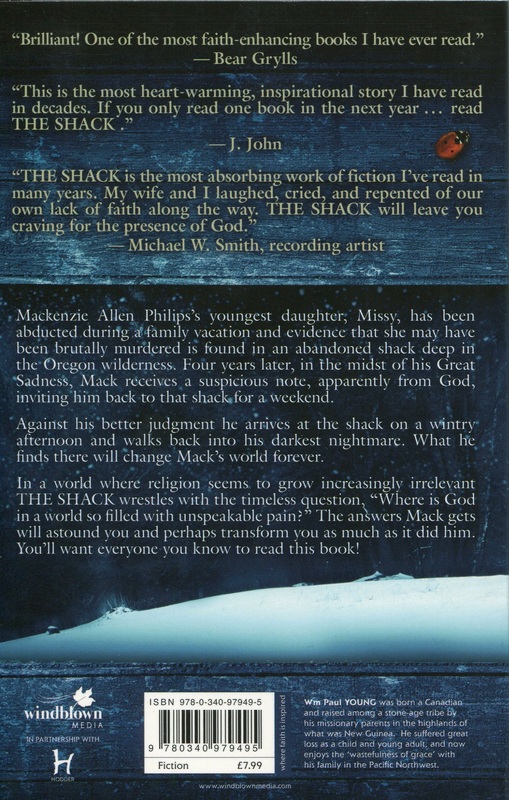 The faith based novel that caused a stir in the church and in literary circles, 'The Shack' is a book people should read before making their own judgement. It is a fantastic growing phenomenon, as originally The Shack was never intended to be published and its initial production produced 14 copies that were intended for friends. That has now risen to the production and the selling of over 4 million copies worldwide and becoming a New York Times bestseller. The pain in this novel is that Mackenzie Allen Philips? youngest daughter, Missy, has been abducted during a family vacation and evidence that she may have been brutally murdered is found in an abandoned shack deep in the Oregon wilderness. Four years later in the midst of his Great Sadness, Mack receives a suspicious note, ostensibly from God, inviting him back to that shack for a weekend. Against his better judgement he arrives at the shack on a wintry afternoon and walks back into his darkest nightmare. William Paul Young, known by his friends and family as Paul is a self-proclaimed 'accidental' author with 'The Shack' being originally written for his 6 children as a present. He wrote as a way to provide unique gifts to his friends and family and this was the birth of 'The Shack'. Living in Canada with his wife and children Paul was raised by missionary parents and he has lived a life where he created his shack, which he describes as a place that is filled with issues and hurt. "When the imagination of a writer and the passion of a theologian cross-fertilize the result is a novel of the order of The Shack." - Eugene Peterson, author of The Message. The Shack by Wm Paul Young was published by Hodder and Stoughton in July 2008 and is our 8500th best seller. The ISBN for The Shack is 9780340979495. The Shack will help you to see God differently, get a new insight into his character and to forgive yourself & others. Seldom can such an unheralded book by an unknown author cause such interest not only in the Christian publishing world, but also in general publishing! Last week (August 2008) it had reached sales of over 2 million copies in Britain alone! Basically this is a novel concerning the mysterious disappearance of a young girl. Four years on, the girl’s father ‘Mack’ receives a note, apparently from God, inviting him back to the place – the shack, where evidence had previously been found which points to his daughter having been murdered there. Against his fear and better judgement, the grieving father decides to go….. The remainder of the book graphically describes him meeting God, Jesus and the Holy Spirit in a manner he never envisaged, i.e. God is a black woman! The book is subtitled ‘Where tragedy confronts eternity’, and the whole aspect of suffering is dealt with at great length. Many people query ‘Why does God allow suffering to happen?’ William Young tackles this question in a unique way. Using fiction as a tool, he is able to reach deep into the human heart and shows how God deals with each one of us in an individual and loving way, if only we will let Him. This book truly brings healing and understanding to one of the most difficult subjects that many of us have to deal with. In my opinion it is an outstanding book, fully deserving of its huge sales. At last a Christian novel that is beautifully written, with a story line that will stretch you. There is much to learn from this book and much to challenge our preconceptions. I understand there has been controversy in the States about the depiction of God in this book - but accept it for what it is - fiction - and you will gain much by the reading of it. Young presents a refreshing aspect of God which could heal many who deem Him as an old, insensative, judgmental, mean tyrant with a big stick-divorced from our pain and in some cases, causing it. Despite some awkward sentences and obvious theological loopholes, the work is riveting. I love the message of forgiveness which I believe is a universal problem with most people-save and unsaved alike. It is FICTION- so that covers the many Biblical misinterpretations- and is vastly creative. Young really kicks down our sacred cows in this work. This book has helped me to see and know the Father, the Son and the Holy Spirit with different eyes. We presume to 'know' about God, yet this book actually makes you realise that there is so much of Him that we don't know - my relationship with Him has become deeper because of reading this. Reviewed by Jan, in church leadership in Leicestershire. A little overwritten in the beginning, but never the less a gripping read that will bring both laughter and tears. It must be good, I've read it twice and will read it again. I can understand the furore of those who forget it is a novel. It challenges our preconceptions of God and encourages us to knock down our belief that we fully understand and 'box' God who has thoughts and ways that are high above our own. Many reviews I have read of this book often contain a line to this effect 'its fiction so it doesnt matter if it doesnt completely line up with the bible'. Yes it is a piece of fiction and not a terribly good piece at that, but where the book really falls is that in attempting to present a 'god' that is more palatable for most people, the author does nothing but present a new version of god that is not the one presented in the Bible. Yes its fiction, but when presenting any version of God, it must hold up when placed against scripture, otherwise it is by nature heretical, blasphemous and very very dangerous. There are numerous heretical traps that the author falls into, and many of the statements made by the shacks God fly in the face of scripture (the whole discussion about god hating structures of hierarchy fly in the very face of the trinity and Jesus' own words!). I do not have time to list them all here, and many wiser and better people than I have already done this (if you search on line there are many such articles detailing the many errors). The saddest thing about this book is not so much what is written by the author, but by the speed at which many brothers and sisters are quick to praise this vision of a god. I plead with you to not to fall into the trap of loving the warm fuzzy God that this book presents, but read the scriptures and see the awesome, mighty, just, and merciful God of the bible, and fall in love with Him. This book will definitely make you think differently about God. You may not agree with his theology but you cannot fail to be moved by the roller coaster of emotions that the book evokes. Hovering on the brink of buying this book? Bet you didn't know God is a verb? Buy this book and find out why! Is the wishy-washy god portrayed in this book the same as the one revealed by Holy Scripture? Compare the simpering answers offered to Mack with the ones our Lord gave to Job and you will see that it is not. The Shack, therefore, is idolatry plain and simple, and no Bible-believing Christian (is there any other kind?) should go anywhere near it. Not only does the author violate both the second and third Commandments (and thereby, by implication, the first Commandment too), but he also completely bungles the theology of the Trinity. I am amazed that so many churches are willing to use this blasphemous book as an evangelical tool. Shame on you! I really appreciated the fact that, although I didn't agree with every theological detail, this book gave me a wonderfully expanded jumping-off point for thinking about God. It actually helped me to process how I 'understand' the Trinity and God's nature. At times I had to remind myself it is a novel. Very moving. Very powerful. Very useful. I was given this book for Christmas & have only read it once because I lent it to someone! The depth of the Trinity relationship was truly inspirational, especially the Holy Spirit. I cannot recommend this book enough! I intend to re-read it very soon. I THINK READING THE SHACK WAS WONDERFULL, IT GETS YOU IMAGINATION FLOWING. IT IS A GREAT STORY AND IT BRINGS YOU CLOSER TO GOD. Fantastic Book, well worth a read to challenge your mind and to encourage you. The Shack - get it now! I bought this book after hearing many friends talk about how helpful it had been to them. I guess on that basis I was approaching it from a positive perspective to start with. However I was aware that this book is not without its critics in the Christian community - you know who you are! I found it very helpful and it spoke to me deeply about the love of God and His plan for all of us. Sure, I don't think it amnswers all the questions one may have, but what is faith without questions? Don't read it thinking it is pure theology - it isn't! What it does very well is to use metaphor to illustrate some key principles that many of us tend to forget. Namely that no matter what the circumstances God still loves you. A great book that will appeal to a wide variety of people, and not just Christians. It addresses pain, doubt, fear and despair and comes back with an answer - there is hope. I really struggled with this.I wanted to love it but found it a difficult book.I read it around other books .It is well written but difficult to keep reading. Reviewed by Anna, following a path! This book was highly recommended to me as being absolutely brilliant, a must read. I felt it did not live up to the hype. As Christian Studies student from an Evangelical background I was not comfortable with the way the Trinity was depicted. Thought some of the Theology was a bit dodgy. This book will make you laugh,cry,feel loved unconditionally and make you stand back and take a good look at your life.This is one of the best christian books I have ever read if you know someone who reads buy them a copy. Whether you're a Christian or not the story itself ties you to your chair and makes you laugh and cry. If you're a Christian (which will cover the vast majority of the people entering this site) then it challenges! It forces you to question your own interpretation of who God is and whether you actually believe the lyrics we sing, You are good, You are good and Your love endures. This book totally changed my idea of God, it made me look at him in a different way - more as a loving God and less as an authoritarian father figure. It was strange thinking of him as a woman at first but it made sense in the book. I would recommend this book to anyone, just don't take all the theology as Gospel. It gave a different perspective on how God views our sadness and feelings. Saved this book as a gift to myself after completing my dissertation earlier this year. I am so glad I got there. The reality of the issues and emotions from the family involved and the very real, calm, loving acceptance of the trinity characters will help many people come to terms with their own traumas or help with understanding of those whose lives have brought major tragedies. The scene with the main protagonist's father was awesome - and offers the opportunity to start working on difficult family relationships on earth, so we can be part of God's Kingdom here and now. Thought provoking and ultimately uplifting! Read this on holiday and was often deeply moved. One to ponder on. There are some very interesting insights. One of my friends read it in a book group as it has been selling well in WHSmiths - not just in wonderful Christian bookshops! A great book for broadening your view of God and His characteristics (we often put him in a box!) and for anyone that has gone through circumstances that cause you to question His presence or your salvation, then this is a good one for you! A great book, made me laugh and cry, and I learnt something too! An amazing book. The most open, raw, questions are asked about the problem of pain, with mind blowing answers from God. It will open your eyes to another way of thinking, and open your heart to God who truely loves though the pain. I've already bought 3 copies to give away to friends! This book gives a perspective on God that is so different and refreshing it really will make you think differently about our Creator, Redeemer and Friend. I have passed it on to lots of my friends, and you will too. I thoroughly recommend it. Reviewed by Grace - mature lady! The Shack was recommended to me by several people as a must read ... however I have to say that I was disappointed. The book took a long time to get started and I did not find the description of God helpful and the book is certainly not a book that I would give away to a friend. I had to struggle to make myself finish it. The Shack is heresy BEWARE!! On page 120 William P Young states that God does not punish sin The bible (Gods Word) states very clearly that God will punish the wicked in hell forever...Also William P Young denies Penal Substitutionary Atonement, this is the doctrine that God punished His own Son on the cross....Do you hear the voice of God ? or are you listening to some other voice ? Is this a book you read for entertainment? if so, I found the first quarter compelling, I loved the way it is written.. but after that it starts to get weird and less interesting. If however it is to be taken seriously as a view of God at work in people's lives, I am uncomfortable about the casual way in which the author treats the subject, seeming to make up his own view of God rather than basing it on what we know from the bible. And I'm not just referring to the issue of God's gender. Reaches into your core & touches you on a deeper level!!! This book touched me in a way that I never expected. It opened my eyes to 'see' God in a way that I needed Him to be, when I could not relate to Him as a father-figure.God in His wisdom knows exactly what we need & He adapts so that He can reach us on a deeper level. There is so much to take in, that I think you will need to read this book several times to fully appreciate it. Having read the book twice, I found the book full of error and the way William Young treats the trinity is unBiblical, unfortunately he mis-represents God's truth. Alot of people are reading this but unfortunately they are not getting the true God of the Bible. The Shack undermines the atonement of Jesus, Christ died for our sins because we deserve punishment for our sins - William Young leaves out that God punishes sin and therefore distorts the word of God. I loved this book, I have read it 3 times so far and it is a book I will keep forever to re read time and again. A miserable book which rejects the Scriptural God of the Bible... can't believe how many folks on here have given it above 1 star. Just shows the state of 'christianity' nowadays. Itching ears, anyone? Take a peek at some articles related to The Shack. Got a question? No problem! Just click here to ask us about The Shack. I've finished The Shack. What might be a good book to read after that - one with the same kind of themes and style. I don't want anything heavy. A:Thanks for your interest in a follow on to The Shack. You might try Wm P Young's second novel, Cross Roads. It is very like The Shack in that the central character experiences sound kind of supernatural encounter with the three persons of The Trinity expressed in very different forms and with different personalities. (Why change a winning formula?) The outcome is life-changing and not just for the main player in the drama. You might also try Michael Neale's The River.